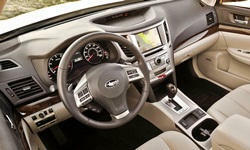 Why the 2014 Subaru Legacy? I have the 2014 Subaru Legacy Limited PZEV. The car is safe and secure in any weather condition. The handling is very good as well. However, the ride is firm, and bumps are noticeable more than I would have expected - even with upgraded tires. The car rides nicely on the freeway, but some road noise is evident. The interior styling on the 2014 Limited version is very good. Visibility front and rear is outstanding, the heated seats, and dual climate zone controls allow for each front seat passenger to be comfortable, and the 10 way power adjusted driver seat, including lumbar adjustment is excellent. The Limited comes with a very good 9 speaker Harmon Kardon Stereo. Both front and rear seat room are very good. Safety is a high point of the Legacy. It has full time all wheel drive, and the Subaru AWD system is among the best. The ABS brakes work very well, and the traction control seems to work very well. As noted earlied, consider switching out the stock tire to a performance all season radial that has good ratings for wet and snow traction. 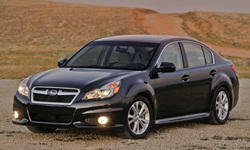 Why Not the 2014 Subaru Legacy? My least favorite thing is the ride which is too firm for my taste and bumps can be felt. The stock Bridgestone EL400 tires are rated poorly on all surfaces by Tire Rack and Consumer Reports. I found a tire dealer who gave me a 250.00 credit for the stock tires, which I switched out for Continental PureContacts, which are outstanding on dry and wet surfaces, and very competent thus far in snow. The stock tires were nearly a dealbreaker for me when considering the purchase.